As a retired serviceman, Wright, 26, is eligible for full government-funded dental coverage. Unfortunately, there isn’t an active military base nearby where he could get treatment. Wright recalled that after spending more than an hour on the phone with TRICARE, the military’s health-care program, he was told to visit the emergency room, where he could get something for the pain. Complaints about the accessibility and quality of health care for veterans — whether for a toothache or a traumatic brain injury — have been mounting for years. In an effort to understand the government’s position on the issue, Sen. Bernie Sanders has invited James Peake, secretary of the U.S. Department of Veterans Affairs, to address Vermonters at town meetings in South Burlington and White River Junction next week. Peake, who was appointed by President Bush in December, is likely to get an earful from Vermont veterans about the challenges of accessing medical, dental and psychiatric services in rural areas. He may also face questions about his views on traumatic brain injury, or TBI, post-traumatic stress disorder and the suicide rate among current and former military personnel. Last month, during a trip to Alaska, Peake suggested that the number of TBI cases among returning vets was exaggerated; he likened some reported head injuries to the kind suffered by highschool football players. During the same trip to Alaska, reported the Fairbanks Daily News-Miner, Peake speculated that the number of veterans committing suicide “is likely lower than has been reported in the media.” This despite ample evidence that U.S. military personnel are attempting suicide at far higher rates than is the civilian population — about 1000 per month, according to one internal military email obtained this year by CBS News. The actual rates of TBI, PTSD and suicide among Vermont veterans weren’t available from the VA as of press time. But to Adrienne Kinne, a veteran and health-science specialist who conducts psychiatric research at the VA Medical Center in White River Junction, Peake’s remarks were insensitive and out-of-touch with the realities she encounters every day. Kinne, a former Army intelligence officer, suggested that suicide is more prevalent than reported among vets, due to the number who either couldn’t access the VA or whose families never report their deaths. She recalled the case of a female vet in Vermont who committed suicide last fall. But because the woman had served in the military less than two years, Kinne said, she was denied VA benefits. 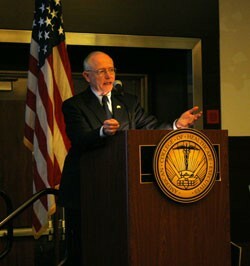 A member of the Senate Committee on Veterans’ Affairs, Sanders supported Peake’s appointment. He said he wasn’t aware of the controversial remarks the secretary has made, and he was reluctant to criticize Peake too harshly in advance of the visit. Sanders describes the situation for returning veterans as “horrendous,” while admitting that with just six months left in the Bush presidency, it’s unclear how much Peake can accomplish. But regardless of whether the next president is John McCain or Barack Obama, Sanders says his upcoming visit will be the first step in tackling a dysfunctional and bloated VA system. You don’t have to tell that to Eli Wright, who waited five days for an emergency root canal because the military couldn’t find a dentist in Vermont who was approved by Tricare to treat him. It cost him $1000 out of pocket, and he’s unsure if the VA will agree to reimburse him. Although he has been diagnosed with PTSD and an anxiety disorder, Wright was told the abscess wasn’t a combat-related injury. Sen. Bernie Sanders and VA Secretary Dr. James Peake will hold a town meeting at 8 a.m., Monday, June 23, at the Holiday Inn, South Burlington. A second town meeting will be held at 4 p.m. at the VA Medical Center, Research Building #4 in White River Junction. Call 1-800-339-9834 for more information.